If you’re short on time and energy, but you want to cut your grocery bill, take advantage of price-matching at Walmart. It’s simple and easy to do–and can save you a lot of time and money. According to , you don’t even need to bring in the competitor’s ad. However, I usually do, just in case there’s any question as to the advertised deal. Instead of running around to three different stores to get the best deals at each of those stores, just circle the best deals in the sale ads at each of those stores and take the ads to Walmart and they’ll match the price. This saves you gas, wear and tear on your vehicle, and time. Plus, it just simplifies things. I love the produce prices at Aldi, but I sometimes find that the produce is really picked over or just not looking too fresh. 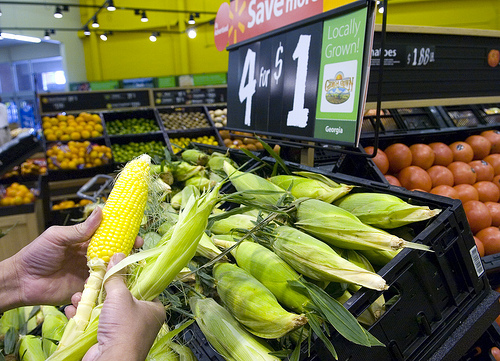 Price-matching the Aldi prices at Walmart will allow you to get the low prices, while also getting fresher produce. Save yourself gas money and time! Don’t drive all the way to the other side of town for a great deal. Just price-match it at Walmart! See an example of a Walmart price-matching trip here. The amount you save will depend a great deal on how much you usually spend and how often you price-match. However, I can almost guarantee you’ll save at least $5-$10 per price-matching shopping trip — not to mention the time and money on gas it will save you. If that’s the case, if you price-match once or twice a month, you’ll easily save $100+ in a year’s time. For more information on how to price-match at Walmart, check out my video blog. Have you price-matched at Walmart before? Hello, I love your blog! Just curious what you do with the great deals you get there and at the health food store. How do you incorporate those finds into your menu plan? I decided to stop trying to price match at Walmart due to the employees and their lack of understanding of the policy. First they said they wouldn’t match loyalty card discounts, which is in direct opposition to their policy online. However, they eventually figured it out. On my last attempt, I tried to match something that a competitor had, say, 2 for $5, so I wanted it for $2.50. They said they can’t match prices like that, but they’d let it slide that one time. At this point I can’t be bothered; the store has too many customers and not enough cashiers anyway. I’m sure every Walmart is different, but the one in East Norriton, PA is off my list. Trust me, they are not different anywhere else. I haven’t stepped into a Walmart in 2013 and it’s my goal not to go into one ever again if it can be avoided. Ugh, Walmart. I haven’t shopped in one since 2010. It is not worth the headache for me. I also avoid Walmart like the plague. Grouchy staff, long lines, messy stores, and their prices aren’t actually all that great compared to my main store (Meijer). I haven’t shopped at Walmart since 2011. Jessica, I’m totally with you on their food prices versus Meijer. I’ve price checked multiple items and Meijer’s prices are lower. For general merchandise, however, I’ve found Walmart’s prices to be lower. Unfortunately, I have a Walmart in town and not a Meijer (I live in Fenton). Tonight, we will be doing grocery shopping at Walmart, simply to save time and gas. But I do love my Meijer! I have had lots of trouble price-matching at Walmart. The employees seem to want to make their own rules or they don’t know they don’t need a competitor ad to price-match. I had one person tell me I could only do a limited number of items but he wasn’t sure how many. Then when I asked for him to call a manager, he yelled at me to not tell him how to do his job. The only thing I price-match there regularly is milk. They don’t seem to bother you about that one. But I would really like to price-match and save time! I just hate to support a company that is so rude and hard to deal with when other places are so friendly and want my business! I really would like to see price matching improved there. It would save me time to shop in one store. But for now I gave up on it as I have similar experiences and is not worth the stress. I have price matched at Walmart, and at my local Walmart it was a hassle pretty much ever single time. I definitely had to have the ad with me (despite the nationwide commercials and then they announcement they would have ads at the register…) and then I had to explain I was price matching, the cashier would scrutinize what I was buying with the ad, come up with a reason they didn’t think it would work, call over a manager to verify they could do it… And the scenarios go on. But I know part of my issue was that Walmart… So others might have better luck. They really really disliked price matching the Aldi ad, and their produce was not usually a good selection anyway, so I just stuck with going to Aldi. They also regularly were out of stock of normal items, so I after about six months I gave up and just kept to Target and Aldi. I had very similar experiences so I am back to shopping at other grocery stores. I buy only a small amount of items from Walmart. Our Walmart won’t price match Aldi’s, anyone else have this issue? I price match Aldi all the time. They even matched Dollar Tree prices for me. Our Walmart does not price match Aldi’s. I raised the question one day to the store manager and he said ‘Aldi’s products and produce are cheap quality so we cannot match it’. I agrued with him that vine ripe tomotoes at Aldi are of the same company like walmart and I showed him the pictures too from my cellphone. He was speechless and gave me the dirty look saying sorry we cannot price match Aldi. From there onwards I tried to avoide going to Walmart. This is happening in Marshfield WI Walmart. My Walmart won’t price match produce anymore. I’m in central California and they actually posted new (very corporate-looking) signs about it. We don’t have Aldi here. Seems like they are changing things regionally? My W-M won’t price match unless it’s the exact same brand (i.e., Chiquita bananas, etc. ), so totally worthless for produce, and they gave me such a hassle when I tried it, I’ll never try again. Not to mention, where I live the produce at W-M is not very good. Aldi has great produce if you get there soon after they open (with the exception of strawberries, which are a hit and miss). I live in a large city. We have tons of Walmarts but since there are so many people, they are packed constantly. Even if the store seems dead, there will always be a huge line at checkout. With that, I have priced matched but I don’t find their other products to be a good deal to warrant getting all of my stuff there. Even if I do that, to check out is a nightmare. The small price to start up the car and drive a quarter of a mile down the road to several more stores with better deals is worth it. However, I could see if you lived in a smaller towns how this would be a better deal. My Mom price matches Aldi. I find it funny that the manager told you Aldi is lesser quality. I laugh at the idea of high quality being an appropriate descriptor for a Walmart. I, too, have stopped price matching at WalMart. It’s way more of a hassle than it is worth. I live in a small town. We have 2 grocery stores, a Family Dollar and a Dollar General. I find it a lot easier to drive 5 miles than to try to price match at Wal-Mart. I disklike the cashiers being snotty about doing it, messing up coupons, arguing with you when you know the policy. They will NOT match Target pricing either. I only go to Wal-mart for items I can get for free with coupons or to buy the 4 items I can’t get elsewhere. I too gave up price matching at Walmart. I go about to various groceries stores to get “their” best prices instead. At least I know when I check out I will get the item I drove 25 miles for at the other stores. I like your idea about pm produce with Aldi prices that might be worth a try. I buy only a small amount of items from Walmart. Only items I need that I have a very good coupon for. I use a very detailed list and I get in and I get out. I do this all the time. Walmart is a mile from my house, and I price march five or six other stores in our town (Target, Aldi, Sprouts, GFF, Uptown/Buy For Less, and Williams). I don’t usually have to show the ad, unless there is a huge (several dollars) difference. I do it with produce, meat, and even groceries like chips and cookies for special occasions. I never thought to do price match for meat! I don’t really like the quality of their meat, but if that’s all I’m getting at a different store, I hate dragging 2 small kids around just for that. Thanks for the info! I also avoid Walmart even for free items. They have argued with me over free items, especially if the coupon is for $1 and the price for the item is $0.97. I’ve also tried to price match and even though the cashier had no problem doing it, he had no idea HOW to do it. It took so long for him to figure it out that the time I spent there wasn’t worth the savings. This has been my experience at 2 different stores. This is good advice in theory, but the reality seems it’s not worth the trouble. We avoid Wal Mart if at all possible! Our Wal Mart is horrible about coupons and price matching. If a coupon does not scan a manager has to be called which can take 15 minutes or more. Many cashiers do not know how to price match so a manager must be called for that too. My Aldi has great produce and is always well stocked so I am sticking with them. Since I started using coupons and shopping sales. I rarely go to Walmart. I live in in mid size area so I have a few options w/o driving out of my way. I have not had any problems price matching or getting overage on my coupons. The shopping experience isn’t that great so I go maybe once a month and use any good coupons with overage. I’ve found a couple of cashiers easier to deal with so if I see them I will go to their line. How do they price match if you do NOT bring in an ad? Do you just tell them how much it costs at the other store and they take your word for it?? they have copies of the local ads at their supervisor’s station and customer service that they can reference if they don’t “believe” you. I despise Wal-Mart and avoid it at all costs. I have tried to price match produce there before and they would not allow it (and that came from the manager). Also, my Aldi’s is wonderful. The cashiers are nice and always happy, the produce is very nice and selection is always great. Maybe it depends on your location, but I am so happy with my aldi’s and would recommend them over wal-mart any day. I live in between two Wal-Marts. One store always makes me feel like it’s a HUGE inconvenience for them to price-match, even though I bring the ad and point out the item to them. They really did not like it when I brought in the flier for our little grocery store, even to the point of asking how many miles away the store was! The other is much better in that regard. However, at least half of the cashiers do not know how to price match. So if I am going to price match, I always go to the friendlier store. I have stopped trying to price match at Walmart too. The manager of the store told us that they don’t price match food so we called headquarters. We were told that they don’t price match store loyalty card prices, BOGOs, and food. When my husband pressed the issue he was hung up on. Not a good experience and not worth the effort! I should add that I don’t just shop at Walmart though. I still try to support other local groceries in my small town. They actually have better prices on some things than Walmart does, and I like the local grocery’s meat better. Plus, I want them to stay in business!!! Awesome. I didn’t realize WalMart would price match Aldi’s produce prices! Thanks so much! I love Aldi’s Bacon and Cheddar burgers. I hope WalMart carries those to price match also! They will only price-match advertised prices, so you’ll want to make sure they are on sale and in the flier. Thank you for this! I had kind of forgotten this. We always get the Aldi ad but it is quite a drive for me to get to Aldi (and not super convenient with three little ones along and not much cart space!) But their produce prices are so tempting! Thank you for this idea, this will save me money! I have had very similar problems with the Walmart stores here in Corpus Christi, Texas. It seems to me that the cashiers (and some managers) do not have a good understanding of the price match policies of Walmart and I end of having to talk to multiple people to get a price match. Ultimately, it is very frustration and time consuming; thus, I too try to avoid shopping at Walmart. Would you consider forwarding these comments to the corporate office of Walmart? I do not want to give you more work, but perhaps it would be helpful for the corporate office to see how consumers view their stores in general and it could result in an increase in training for their employees. It definitely could not hurt. I encourage everyone to bring the price-matching policy with you when you shop and to Walmart corporate if you have issues with your store following it. Oftentimes, a cordial call into corporate will do wonders! Thanks again for all the money saving tips and sales you post! They are great and definitely help me save time and money! Has anyone ever tried using coupons w/price matching at Walmart? Yes, I have no problems doing this. I always put all my price match stuff together at the end of my stuff and then when they are done ringing it all up I hand them my stack of coupons. I do know they will not take other store coupons like Target, but if it is a manufacter coupon they will. I tried it once and the cashier wouldn’t let me. It was when they really started advertising the price matching w/out having to bring your ad in, so I didn’t push it. They are so inconsistent. From reading all the comments, it sounds like there are quite a few Wal-Mart stores that are not abiding by their corporate policies. That is unfortunate and I am sorry you did not have a good experience. I price match at my Walmart all the time. They don’t give me any grief and sometimes they even tell me a better price for milk or such. I go online to all the grocery stores in my area and pull up their ads. I make a shopping list using their online ad and print it out. I take that to the store to have with me for reference and also it has store name and sale dates on the printout in case there is a problem. I have never had a problem or been questioned. I also make sure that everything I want to price match is at the end of the belt so that the cashier can easily tell what I am price matching. They pick up an item, ask me the price, and ring it in. It doesn’t take long and has never been a problem. I have no problems price matching at my WM. I just take a list and write everything down and which store it was advertised. No problems at all. I do agree some cashiers look up everything up in their pages with price match. I try to go later in the evening when some of the ten aged kids are there and it is no hassle. I also do have an Aldi’s very close so I split my time between both. My Walmart has horrible fruit and so does Aldi. Both places have squishy, bug eaten, rotten fruit. 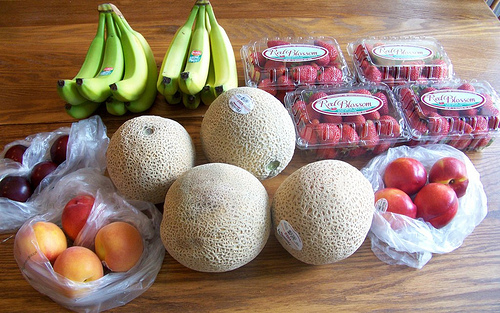 Wegmans spoils me… the fruit at Wegmans always looks so amazing, tastes great, and lasts so much longer. And prices are pretty good. Thanks for this! I occasionally price match at Walmart but didn’t realize I could match generics and fruits. We are in a small town, with only three stores, so Walmart is always on our list for the week. Well, I know this is a great help for some. But I personally can’t stand Walmart. Shopping there always takes forever…I feel like I save more time going to several stores! But for some, like my sister, price-matching is a blessing. In her town, Walmart is basically the only place to get groceries. She’s been able to price-match at stores in the nearest city. She says the produce is not that great, and they often don’t have things…even basic items like carrots! But since that’s her only option, at least she is able to save a little here and there. I avoid Walmart they are terrible with coupons and won’t match Aldi’s ads. The last time I was told they aren’t even matching produce or meat so why bother going to them. I price match at walmart sometimes. I really hate shopping there, but with their prices being so much lower on a lot of non food items like toilet paper, and things like that, I don’t have much choice. I live out in the country and so it’s a bit of a drive, walmart is the closest store. Last year, Lowes, had their canning jars on sale as a clearance for half price. They were in the ad, but out of stock in the store. I printed out the ad online, because I didn’t have a copy, and walmart refused to price match because they were convinced that it was an online only sale and they don’t price match to online prices. You can image how irritated I was with them, I do a LOT of canning and the price on jars has gone sky high so half price was a HUGE bargin! Wow. Reading all of these comments makes me very, very glad for the Iowa-based store Fareway. They won’t price match Aldis, but they will price-match other local competitors, and 60-70 percent of the time when I come in with the sale flyer from the other grocery store, they’ve already matched the prices on their shelves, with images from their competitors’ flyers. And, unfortunately, the Walmart stores in my city are in bad shape, and not very well cared for. I’ve never thought to try this before but did today! I accidentally looked at the aldi ad from another area and got my produce a little cheaper, but my cashier did well. A little cranky but I just tried to leave with a smile and make sure to thank her. It does have to be a tough job having to heard all those people through the line so quickly and I am sure they don’t always have the nicest most patient customers. Thanks for sharing! I avoid price matching at walmart like the plague! When it was first announced, I got super excited and for the first few months everything went smoothly. Then they started saying you has to have an ad (which their policy clearly says you don’t). I usually has one, but one day I forgot and was PM b1g1 frozen waffles. They got a manager who told me I needed the ad. I showed her the policy that said I didn’t and she still insisted. I pulled up the ad on my phone and she yelled that they don’t accept online ads. I told her it was identical to the paper ad which their policy clearly stated I DIDN’T need. She let it go. The next 3 times I was told they no longer PM fresh produce or meat which their policy states that they do. I showed the policy from their corporate site and they said it was old, even though I pulled it up from my phone right in front of them! I asked to doeak to a manager snd waa tokd tbey were busy. i yold them I’d wait. I waited 45 minutes to be told by a “manager” that they got a memo from corporate that they don’t PM any fresh food anymore and the website wasn’t updated. I emailed corporate who had a lacky asst. manager call me back. He just apologized, said he was t sure what their policy was and he’d look into it! Really?!?! That’s it! No follow up or anything! I regularly save $20 a week by price matching, and my last trip was so spectacular I saved something like $50 on meat alone. I’ve been wanting to try this but I have a question. One of our Mexican grocery stores here has the BEST prices on produce but it doesn’t have a brand listed. Does WalMart fight that since there is no brand on the ad? I’ve never had them ask the brand on produce, but like Crystal said, it has to be an advertised price in their flyer for the week. This is just a thought…I would shop at the Mexican grocery store in that case. Many of the smaller stores are having a hard time making it, and it’s good to support them. I don’t shop at Walmart, partly because Meijer/Kroger are closer to me and partly because Walmart does tend to put a lot of smaller stores out of business. It is a larger chain out here and besides that, it isn’t in a good part of town so I wouldn’t be comfortable going there. Mine doesn’t demand a brand. Our favorite grocery store price matches. I really prefer not to shop at Walmart so we’re doing just as well to price match at our local least expensive grocery store anyway. I am a fan of price matching. I went to Walmart yesterday and left the store almost in tears. I had a lot of great coupon deals, and I had everything all planned out. I also had my 2 kids with me, and they were getting restless. Well, the cashier saw my coupons and immediately said that the “policy had changed a couple of weeks ago” and if I had 4 items and 4 coupons, she could only accept 1 coupon. I stood my ground and said that it was 1 coupon per item, and she finally called the CSM who had no clue about anything but agreed to accept all my coupons. I felt like a criminal! I don’t even try to price match there anymore – I used to do it a lot about 2 years ago, but every single cashier has his/her own opinion on how the policy needs to be enforced. I am sick of planning my trips out and getting disappointed. I have price matched in Walmart but in NH they will not price match some stores ads ! I have recently started to price match our local Walmart as we have had a remodel of our Fred Meyer and with Alberton’s buy-back their company they are lowering prices and we have a price war on food in our area; so I use it to my advantage. A few helpful tips that I have used: Always have the ad with me to match. I do the price matching items first…in case they have to call for a mgr (which has happened). I go to the store at 8:30ish AM to get the “fresh” cashiers and I always go to the one that is closest to the “mgmt cashier station” as I find they have the most “senior” cashiers there to help me. Finally, I just SMILE and thank them for all they helped me save “a lot” of money, time and energy. I always leave and say “I will be back!” It is worth the try…it worked for me. Be prepared for some cashier resistance if price-matching means you will be getting a good deal. I took an ad to Walmart yesterday for “california cherries” competator price 1.97/lb. The cashier insisted that those were smaller than the “california cherries” that walmart carries. They were the exact same kind of cherry, she was upset because I would be saving around $6 for the bag. In the end she matched the price anyways, but it was a hassle. I don’t have a lot of time to shop several stores and use coupons so I price match at Walmart and save at least $5 to $10 per week. I have saved $15 several times. Sometimes my cashier will tell me of a better price match and give it to me for that price. Our small-town Walmart has a wonderful manager and I think that his cashiers are friendly and well-trained. I have to agree with the posts on the walmarts in arkansas. I price match four to six stores on a weekly basis, including aldis without much trouble. I always take my ads and often use coupons as well. One walmart has recently set a limit of 6 of the same coupon per transaction, but they will willingly let me do seperate ones. I realize that i am very lucky. I tried to price match today using Aldi flier and the cashier told me that they don’t do Aldi prices that it states in their flier/brochure (she didn’t say the word “policy”), that there are a few other stores they don’t price match like Big Lots, dollar store (and something else I had forgotten). I haven’t read the policy for a long time, so I was very surprised (especially since I had just read this article), but I didn’t have the policy with me. I even told her that I have price matched like that before and she told me that they shouldn’t have. So I went online now and nowhere does it say what the cashier had just said to me. Target also does price matching, but you do need to have a printed ad. They will also match the prices of several websites, including Amazon. I also wanted to share a excellent app for iPhones to help you save more money at Walmart. This app has helped me save money by just taking my cellphone there even if I forget to write sales down from other ads…it’s called grocer pal and its a penny-saver. I love your blog and will keep you in my favorites.. I agree with so many others. I can usually do okay price matching – milk and produce, on occasion. However, when it comes to coupons, I’ve given up. The Walmarts in Fort Wayne are continually questioning my legitimate coupons so I have taken my shopping elsewhere. I stick to Meijer and Kroger, where my coupons are always accepted. I’ve tried Price Matching at Walmart multiple times. Each experience was difficult, but in different ways. Once, the cashier was happy to match, but didn’t know how to do it. The other time, the cashier refused to do it. Either way, managers were always called over and the wait was VERY long. For those who like to match, it’s much, much easier at Target. My only complaint there is that it has to be done at customer service and I can’t see prices as they’re rung up. I LOVE the Wal-Mart price matching policy. With milk alone I almost always save $4/week – times 52 weeks that’s over $200! We drink 4 gallons a week with our family of five, and with competitors using milk as their “hook” I can price match at wal-mart and not have any problems. Our Wal-Mart Neighborhood Market (I use for small grocery runs, verses going to the supercenter one that I use for the big bi-weekly trips) is so good about price matching they don’t even ask if you want to match it. The cashiers have always automatically matched milk for me, I’ve never had to ask. Thanks for your efforts, Crystal! This is one of the best money saving tips that I utilize. This may sound like a silly question, but the closest Aldi is 40 miles away. Does Walmart still price match to stores like these, or do they have to be local in order to price match? I have had great experiences price matching at my local Walmart in Kansas. I think some of the main things to know when doing this is be confident and if you have a good experience with a cashier look for them again (I have a couple that I will wait a long time to check out with). Also pay attention to the size advertised and make sure to find the exact same item. I would also recommend calling your Walmart and talking to the store manager about their price match policies…do they match store brands? What cities or areas do they match? Do you need to have an ad with you? Write that managers name down for reference incase you run into difficulties at the register. We have saved hundreds of dollars just in gas not driving from store to store for deals. We love price matching!!! I love price matching at walmart! I price match almost every time I go in (and I started doing once a month shopping to cut down on impulse buying). Unfortunately my walmart just stopped doing price matching, now they only do ad matching. It used to be that they would match the price that any store had. Now they will only match the prices that are in the ads, even if I know the unadvertised price that the store is offering. One idea for price matching at walmart that many people are unaware of is that walmart does ad match good friday sale prices. You have to be checking out during the time that the advertised sale is going on, but it is a great way to get the good friday prices without as much craziness. We are not super early risers, wait in line for hours, type of people so we generally go out in the middle of the day and take the ads we are interested in (we had scouted them out the night before) and look for the items that we want at walmart. The side of this is that since they are not walmart’s sales and so few people think to ad match on good friday they rarely run out of the things that we are wanting. We discovered this one year after spending a couple hours at other stores only to find that they had already sold all of the things we were after. Our last stop was walmart and we noticed that they had all the things in stock so we asked if we could price match. Our walmart will price match the most similar item, so sometimes we get a better item than was in the ad for the sale price. У нашей организации нужный web-сайт , он описывает в статьях про система орошения.